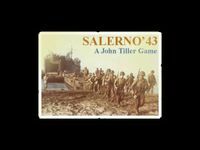 Salerno '43 covers the Western Allies' return to Europe as they invade Italy in the autumn of 1943. They are met at the Salerno beachhead by desperate German counterattacks. Had the Allies been defeated here, Hitler's southern flank would have been secure. But the Allies clawed their way ashore, fighting inland against some of the toughest outfits in the Wehrmacht. Also featured are the campaigns of the Anzio landings in 1944, as well as the German airdrop on Crete in 1941. By default, units are of battalion size. However, players may break them down into companies for more realistic play. - Crete - Island and Sea (310x100 hexes).